در این مقاله بخشی از گستره شهربابک، در شمال باختر استان کرمان مطالعه می‌شود که از دید زمین‌شناسی بخشی از ایران مرکزی و کمربند ارومیه- دختر است. واحدهای سنگی این حوضه در دوران میوسن تحت تأثیر تنش‌های فشاری با روند شمال ‌خاوری قرار گرفته‌اند و دگرشکلی با گسترش چین‌ها وگسل‌ها با روند شمال ‌باختری- جنوب‌ خاوری مشخص می‌شود. هدف این مقاله رمزگشایی دگرشکلی چند مرحله‌ای و تاریخچه تنش دیرینه در بخشی از ایران مرکزی در گستره شهربابک است و اینکه چطور ابعاد مختلف زمین‌شناسی با میدان‌های تنش در طول زمان ارتباط پیدا می‌کنند. از سوی دیگر نشان داده می‌شود که چگونه دگرشکلی‌های شکننده و تحلیل تنش دیرینه می‌تواند در تفسیر تکامل زمین‌ساخت پس از برخورد سودمند باشند. رمزگشایی توالی رویدادها دگرشکلی، که ساختارهای امروزه‌ گستره مورد مطالعه را شکل داده‌اند؛ با استفاده از تحلیل زمین‌ساخت شکننده صورت می‌گیرد که شامل وارون‌سازی تنسور تنش است و از داده‌های لغزش گسل به دست می‌آید. از این رو مطالعه آماری روی رابطه میان میدان‌های تنش مختلف و چین‌خوردگی‌ها صورت گرفت تا از این راه، درک بهتری از تاریخ دگرشکلی فشاری حاکم بر گستره به دست آید. بازسازی سامانه‌ای زمین‌ساخت شکننده اجازه می‌دهد تا یک چرخش پادساعت‎گرد در مسیر اصلی فشارش در طول زمان مشخص شود. به‌طوری ‌که دو مسیر فشاری N55E و N84E از اواخر کرتاسه تا اواخر میوسن پیش از چین‌خوردگی ایجاد شده و فشارش همزمان با چین‌خوردگی N40E در اواخر میوسن شکل گرفته است. 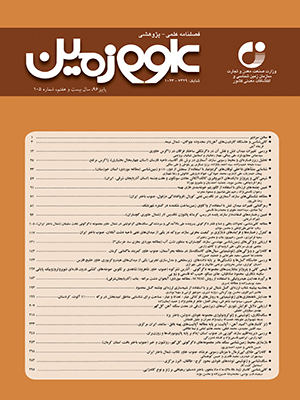 پس از چین‌خوردگی، در پلیوسن مسیر فشارش به N29E تغییر وضعیت داد و در پایان در زمان پلیستوسن مسیر فشارش به N3E رسید. اگر چه این چرخش پادساعت‌گرد مسیر تنش فشاری، در طول زمان پیشرونده بوده است؛ تحلیل‌ها نشان می‌دهد که سه رژیم تنشی مشخص؛ پیش، همزمان و پس از چین‌خوردگی وجود داشته و با رویداد فشاری منطبق است. از این رو با تحلیل تنش و مشاهدات صحرایی مشخص شد که بسیاری از گسل‌های راستالغز راست‌بر نسل اول به عنوان گسل‌های معکوس با روند شمال باختر- جنوب خاور در بخش جنوب باختر ایران مرکزی از ناحیه شهربابک فعال شده‌اند. این نتایج می‌تواند توسط فرضیه تغییر چرخش پادساعت‎گرد در مسیر صفحه عربی با توجه به صفحه اوراسیا و چرخش بلوکی ایران مرکزی حمایت شود. In this paper a part of the Shahr-e-Babak area in NW-Kerman is studied, which is geologically located in Central Iran and Urumiyeh- Dokhtar Belt. The basin was strongly affected by compression in Miocene times, in which deformation is characterized by development of NW-SE trending fold and thrust belt. In this paper, we aim atdeciphering polyphase deformation and paleostress history of part of the Central Iran in the Shahr-e-Babak area, and that how various geological aspects may be related to a stress field that has been reoriented through time. Also, we indicate how the brittle deformation studies and paleostress analyses may contribute in the interpretations of the post-collisional tectonic evolution of this area. In this paper, by using systematic brittle tectonic analyses, including stress tensor inversion form fault-slip data, we decipher the succession of deformational events that resulted in present-day structures. Therefore, a statistical view of the brittle tectonic reconstructions taken as a whole leads one to better understand the relationships between the different stress fields and folding events that governed the history of compression in this area .The systematic reconstruction of brittle tectonic regimes led us to characterize an anticlockwise change in the main direction of compression through time. Thus, it can be seen that the late Cretaceous to late Miocene pre-folding N055° and N084° compression was followed by syn-folding N040° compression in the Miocene. The Miocene compression then continued into the Pliocene post-folding N029° direction, and changed afterward to the Pleistocene-Recent post-folding N003° direction. Although this general anticlockwise rotation of compression has probably been progressive through time, our data suggest three distinct stress regimes that (1) predate, (2) are contemporaneous with, and (3) post-date the more consistent compressional stress regime of the folding and thrusting process. According to this reconstruction, it is confirmed that many local right-lateral strike–slip faults were reactivated from NW-SE reverse faults in the Sahahr-e-Babak area of SW Central Iran .These results could properly support the hypothesis of a significant anticlockwise change in the movement direction of the Arabian plate with respect to the Eurasian plate and block rotation in Central Iran. Ahmad, T. and Posht Kuhi, M., 1993- Geochemistry and petrogenes is of Urumiah–Dokhtar volcanic belt around Nain and Rafsanjan area; a preliminary study: treatise on the geology of Iran. Iranian Ministry of Mines and Metals, p 90. Alavi, M., 2007- Structures of the Zagros fold-thrust belt in, American Journal of Science, 307: 1064–1095. Angelier, J., 1979- Determination of the mean principal directions of stress fora given fault population. Tectonophysics, 56: T17-T26. Angelier, J., 1984- Tectonic analysis of fault slip data sets. Journal of Geophysical Research, 89: 5835-5848. Angelier, J., 1989- From orientation to magnitudes in paleostress determinations using fault slip data. Journal of Structural Geology, 11:37-50. Angelier, J., 1994- Fault slip analysis and paleostress reconstruction. In: Hancock, P.L. (Ed. ), Continental Deformation. Pergamon, Oxford, pp. 101–120. Armijo, R., Carey, E. and Cisternas, A., 1982- The inverse problem in microtectonics and the separation of tectonic phases. Tectonophysics, 82: 145-160. Berberian, F., Muir, I. D., Pankhurst, R. J. and Berberian, M., 1982- Late Cretaceous and early Miocene Andean type plutonic activity in northern Makran and central Iran. Journal of Geological Society of London, 139: 605–614. Bott, M. H. P., 1959- The mechanisms of oblique slip faulting. Geological Magazine, 96: 109-117. Carey, E. and Brunier, B., 1974- Analyse the´oretique et nume´rique d’un mode`leme´canique e´le´mentaire applique´ a I’e´tude d’une population de failles.Comptes Rendus de l’Acade´mie des Sciences, Paris D279, 891-894. Delvaux, D. and Sperner, B., 2003- Stress tensor inversion from fault kinematic indicators and focal mechanism data: the TENSOR program. In: Nieuwland, D. (Ed. ), New Insights into Structural Interpretation and Modelling. Geological Society London, Special Publications, 212: 75–100. Dercourt, J., Zonenshain, L., Ricou, L. E., Kazmin, G., LePichon, X., Knipper, A. L., Grandjacquet, C., Sbortshikov, I. M., Geyssant, J., Lepvrier, C., Pechersky, D. H., Boulin, J., Sibuet, J. C., Savostin, L. A., Sorokhtin, O., Westphal, M., Bazhenov, M. L., Lauer, J. P. and Biju-Duval, B., 1986- Geologicalevolution of the Tethys belt from the Atlantic to Pamirs since the Lias. Tectonophysics, 123:241–315. Dimitrijevic, M. D., 1973- Geology of the Kerman region. Geological Survey of Iran, Report, 52: 334p. Dimitrijevic, M. D., Dimitrijevic, M. N. and Diordjevic, M., 1971a- Geological map of Anar (sheet no. 7051, scale: 1/100,000). Geological Survey of Iran. Dimitrijevic, M. D., Dimitrijevic, M. N. and Diordjevic, M., 1971b- Geological map of Dehaj (sheet no. 6951 scale: 1/100,000). Geological Survey of Iran. Dimitrijevic, M. D., Dimitrijevic, M. N. and Diordjevic, M. 1971c- Geological map of shaher-e-Babak (sheet no. 7050, scale: 1/100,000) Geological Survey of Iran. Etchecopar, A., Vasseur, G. and Daigniers, M., 1981- An inverse problem in microtectonics for the determination of stress tensors from fault striation analysis. Journal of Structural Geology, 3:51-65. Federico, L., Crispini, L., Vigo, A. and Capponi, G., 2014- Unravelling polyphase brittle tectonics through multi-software fault-slip analysis: the case of the Voltri UnitWestern Alps (Italy). Journal of Structural Geology, 175–193. Glennie, K. W. 2000- Cretaceous tectonic evolution of Arabia s eastern plate margin: A tale of two oceans, in Middle East models of Jurassic/Cretaceous carbonate systems. SEPM (Society for Sedimentary Geology) special public, 69: 9-20. Guest, B, Guest, A. and Axen, G. J., 2007- Continental and oceanic lithosphere in mutual compression: lithospheric buckeling as a mechanism for uplift and subsidence in northern Iran and the south Caspian. Global and Planetary Change, 58: 435-53. Hassanzadeh, J., 1993- Metallogenic and tectono-magmatic events in the SE sector of the Cenozoic active continental margin of Iran (Shahr- e- Babak area, Kerman province). Unpublished Ph.D. thesis, University of California, Los Angeles, p 204. Hippolyte, J. C., Bergerat, F., Gordon, M. B., Bellier, O. and Espurt, N., 2012- Keys and pitfalls in mesoscale fault analysis and paleostress reconstructions, the use of Angelier’s methods. Tectonophysics: 581, 144–162. Hooper, R. J., Baron, I., Hatcher, R. D. and Agah, S., 1994- The development of the southern Tethyan margin in Iran after the break- up of Gondwana- Implications for the Zagros hydrocarbon province. Geoscience (Geological Survey of Iran: 4, 72-85. Huang, X., Shi, W., Chen, P. and Li, H., 2015- Superposed deformation in the Helanshan Structural Belt: Implications for Mesozoic intercontinental deformation of the North China Plate. Journal of Asian Earth Sciences, 114: 140–15. Jackson, J. and McKenzie, D., 1984- Active tectonics of the Alpine–Himalayan Belt between western Turkey and Pakistan. Geophysical journal Review Astros Society, 77: 185–264. Jaeger, J. C. and Cook, N. G. W., 1969- Fundamentals of Rock Mechanics. Methuen, London. 250 p.
Kernstocková, M. and Melichar, R., 2009- Numerical paleostress analysis the limits of automation, Trab. Geol., 29:399–403. Lacombe, O., 2012- Do fault slip data inversions actually yield “paleostresses” that can be compared with contemporary stresses? A critical discussion, C. R. Geoscience, 344: 159–173. Lacombe, O., Mouthereau, F., Kargar, Sh. and Meyer, B., 2006- Late Cenozoic and modern stress fields in the western Fars (Iran): implications for the tectonic and kinematic evolution of central Zagros. Tectonics, 25: TC1003. Doi: 10.1029/2005TC001831. Liesa, C. L. and Lisle, R. J., 2004- Reliability of methods to separate stress tensors from heterogeneous fault-slip data. Journal of Structural Geology, 26: 559–572. McInnes, B. I. A, Evans, N. J., Belousova E. and Griffin, W. L., 2003- Porphyry copper deposits of the Kerman belt, Iran: timing of mineralization and exhumation processes. CSIRO Sci. Res. Rep. 41. McInnes, B. I. A., Evans, N. J., Fu, F. Q. and Garwin, S., 2005- Application of thermo chronology to hydrothermal ore deposits. Review Mineral Geochemist 58:467–498. McQuarri, N., Stock, J. M. M, Verdel, C. and Wernicke, B. P., 2003- Cenozoic evolution of Neotethys and implications for the causes of platemotions. Geophysics Research Lettvani, 30: 20-23. Michael, A. J., 1984- Determination of stress from slip data: faults and folds. Journal of Geophysical Research, 89: 11517-11526. Navabpour, P., and Barrier, E, 2012- Stress states in the Zagros fold-and-thrust belt from passive margin to collisional tectonic setting. Tectonophysics, 581: 76–83. Navabpour, P., Angelier, J. and Barrier , E., 2007- Cenozoic post-collisional brittle tectonic history and stress reorientation in the High Zagros Belt (Iran, Fars Province) Tectonophysics, 432: 101–131. Navabpour, P., Heydarzadeh, Gh., Mafi, A., Sheikholeslami, M. R. and Haghipour, N., 2006- A preface to the paleostress reorientations in the Kopet–Dagh after Triassic. Geosci. J. Geol. Surv. Iran 15 (59),176–183 (in Farsi). Nemcok, M. and Lisle, R. J., 1995- A stress inversion procedure for polyphase fault/slip data sets. Journal of Structural Geology, 17: 1445-1453. Nemcok, M., Kovac, D. and Lisle, R. J., 1999- A stress inversion procedure for polyphase calcite twin and fault/slip data sets. Journal of Structural Geology, 21: 597-611. Radaideh, O. M. A. and Melichar, R., 2015- Tectonic paleostress fields in the southwestern part of Jordan: Newinsights from the fault slip data in the southeastern flank of the Dead Sea Fault Zone, Tectonics, 34, doi: 10.1002/2015TC003919. Richards, J. P., 2003- Tectono-Magmatic Precursors for Porphyry Cu-(Mo-Au) Deposit Formation. Economic Geology, 98: 1515-1533. Saintot, A. and Angelier, J., 2000- Plio-Quaternary paleostress regimes and relation to structural development in the Kertch-Taman peninsulas (Ukraine and Russia). Journal of Structural Geology, 22: 1049–1064. Saintot, A. and Angelier, J., 2002- Tectonic paleostress fields and structural evolution of the NW-Caucasus fold-and-thrust belt from Late Cretaceous to Quaternary. Tectonophysics, 357:1–31. Sato, K. and Yamaji, A., 2006- Embedding stress difference in parameter space for stress tensor inversion. Journal of Structural Geology, 28: 957-971. Sha, J., Suen, H. and Lin, G., 2003- Separation of polyphase fault/slip data: an objective-function algorithm based on hard division. Journal of Structural Geology, 25: 829-840. Sha, Y. and Lin, G., Li, Z., 2004- A stress inversion procedure for automatic recognition of polyphase fault/slip data sets. Journal of Structural Geology, 26: 919-925. Shafiei, B. and Shahabpour, J., 2008- Gold distribution in porphyry copper deposits of Kerman region, Southeastern Iran. (Geosciences) Geological Survey of Iran, 19:247–260. Shahabpour, J., 2007- Island-arc affinity of the Central Iranian Volcanic Belt. Journal of Asian Earth Sciences, 30: 652–665. Shan, Y., Lin, G., Li, Z. and Zhao, C., 2006- Influence of measurement errors on stress estimated from single-phase fault/slip data. Journal of Structural Geology, 28: 943-951. Sippel, J., Scheck-Wenderoth, M., Reicherter, K., Mazur, S., 2009- Paleostress states at the south-western margin of the central European Basin System: application of fault-slip analysis to unravel a polyphase deformation pattern. Tectonophysics, 470: 129–146. Sperner, B. and Zweigel, P., 2010- A plea for more caution in fault–slip analysis, Tectonophysics, 482: 29–41. Sperner, B., Ratschbacher, L. and Ott, R., 1993- Fault-striae analysis: A Turbo Pascal program package for graphical presentation and reduced stress tensor calculation. Computer Geosciences, 19: 1361–1388. Vernant, P. and Chery, J., 2006- Mechanical modeling of oblique convergence inhere Zagros, Iran. Geophysical Journal International, 165: 991-1002. Vernant, Ph., Nilforoushan, F., Hatzfeld, D., Abbassi, M. R., Vigny, C., Masson, F., Nankali, H., Martinod, J., Ashtiani, A., Bayer, R.,Tavakoli, F. and Chéry, J., 2004- Present-day crustal deformation and plate kinematics in the Middle East constrained by GPS measurements in Iran and northern Oman, Geophysical Journal International, 157: 381–398. Wallace, R. E., 1951- Geometry of shearing stress and relation to faulting. Journal of Geology, 59: 118-130. Xu, X., Tang, S. and Lin, S., 2016- Paleostress inversion of fault-slip data from the Jurassic to Cretaceous Huangshan Basin and implications for the tectonic evolution of southeastern China. Journal of Geodynamics, 98: 31–52. Yamaji, A. and Sato, K., 2005- MI Viewer, Version 4.10. Division of Earth and Plantar Sciences, Kyoto University, Kyoto. Yamaji, A., 2000a- Multiple inverse method applied to mesoscale faults in mid-Quaternary sediments near the triple trench junction off central Japan .Journal of Structural Geology, 22: 429-440. Yamaji, A., 2000b- The multiple inverse method: a new technique to separate stresses from heterogeneous fault-slip data. Journal of Structural Geology, 22: 441-452. Yamaji, A., Otsubo, M. and Sato, K., 2006- Paleostress analysis using the Hough transform for separating stresses from heterogeneous fault-slip data. Journal of Structural Geology, 28: 980-990. Yamaji, A., Sato, K. and Otsubo, M., 2005- Multiple Inverse Method Main Processor, Version 5.31. Division of Earth and Planetary Sciences, Kyoto University, Kyoto. Yamaji, A., Sato, K. and Otsubo, M., 2011- Multiple Inverse Method Software Package, Main Processor version 6.2, User’s Guide, Division of Earth and Planetary Sciences, Kyoto University, Kyoto. Zalohar, J. and Vrabec, M., 2007- Paleostress analysis of heterogeneous fault-slip data: the gauss method. Journal of Structural Geology, 29: 1798-1810. Zalohar, J., 2015- On a new law of faulting along tectonic wedges: Gust explanation of the preferred (paleo) stress states in the Earth's crust, Journal of Structural Geology, 77: 107-125.